Where is the “Why?” in Your Employment Background Screening Program? In working with employers we often come across companies that simply want to “check a box” with their background screening efforts. Typically their motivation to run an employment background check stems from a need to satisfy some real or arbitrary requirement and they’re not necessarily focused on the bigger picture of how their efforts contribute to the overarching goals of the organization. While there may not be anything wrong with this approach, it certainly won’t deliver the strategic value that is realized when a background screening program is approached like other valuable business projects or processes. A recent article by a leading management consulting firm addressed the issue of why “why?” is so often missing in the decision making process. In the article, the firm outlines how asking why can help organizations avoid poor decisions and stop bad ideas in their tracks. In exactly the same way, managers must take a holistic and systematic approach to understanding the problems we’re trying to solve with our employment screening programs and why we screen in the first place. We have to know why. It must be crystal clear. And even though getting to the answer might look as if some newly minted MBA did it to make himself look smart, it actually is quite easy, simple, and quick to find the answer. And guess what? When you take the time to build a program that addresses the “why?” of it all, it will always work! Let’s look at how we approach building a holistic employment screening program. If the business return is there, you need a plan for getting from your current state to your desired state. This will become your overall strategy. The diagram below depicts the process we’ve just explained. 1. WHAT type of background screening program do we need? 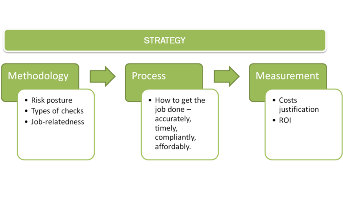 This is the methodology. 2. HOW will we get the job done? This is the process. 3. WHY are we doing this? This is the business rationale. Which box do you spend the most time in? Do you spend the most time designing your methodology, or deciding what to do? Or do you spend most of your time running the process, or figuring out how to get the background checks done? What about measurement? How much time do you spend measuring the results and justifying the costs of your employment screening program? If you spend most of your time on process, your process is likely broken. After all, your process doesn’t matter if it’s not doing what it’s intended to do. If you don’t understand why you’re doing what you’re doing, it’s all just an expensive exercise. If you can’t cost justify an employment screening effort, then stop doing it. It’s sad to say that the great failure of HR is to get mired in the process and get nothing accomplished. Instead, we need to spend more time in the “why” and understand what the outcomes tell us about our methodology and process. Is it working? And as mentioned earlier, this is not very difficult to accomplish. If you do this in a disciplined way and you’re honest with your organization, this will work every time. It’s repeatable. It’s effective. It makes sense. 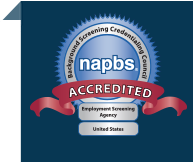 Let us help you build a holistic program with employment screening services that address the whats, hows, AND whys.